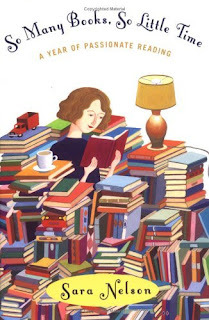 So Many Books, So Little Time is a terrific and engaging book about reading! The author, Sara Nelson makes a New Year's resolution to document a year of reading, and makes a list of books she wants to read. (Naturally I was hooked by the concept straight away). Nelson intends to read and review a book a week - quite a goal considering she is also an editor and reviewer!! Nelson quickly discovers that it's impossible to stick to her list and allows fate to bring the books to her. Nelson's passion for reading is contagious, and it's hard not to be jealous of her cherry shelves and expansive library. Easy to read and full of comments and references to probably hundreds of books, I thoroughly enjoyed it. I even added several books to my own book list after reading it. I would highly recommend this book to any bookworm.